The kitchen is the room in the house where everyone gathers. Whether it is for a meal, a drink, or just to hang out, this central room in the house gets a lot of attention. Since the kitchen is such a busy space, it makes sense that it also be one of the most beautiful places in a home. The room needs to be spacious and open to serve every need, but it also needs to have a little style and some personal details. Years ago, kitchens were small, tight and functional. Today, floor plans have opened to allow more space and room to move. Kitchens also used to be primarily bright, cheery colors to make them look bigger.  Now, darker colors are popular as well. 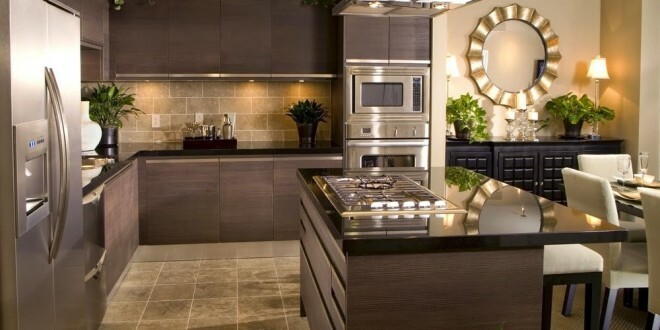 Modern kitchens mix a variety of features like tile back splashes, marble counter tops, and stainless steel appliances. 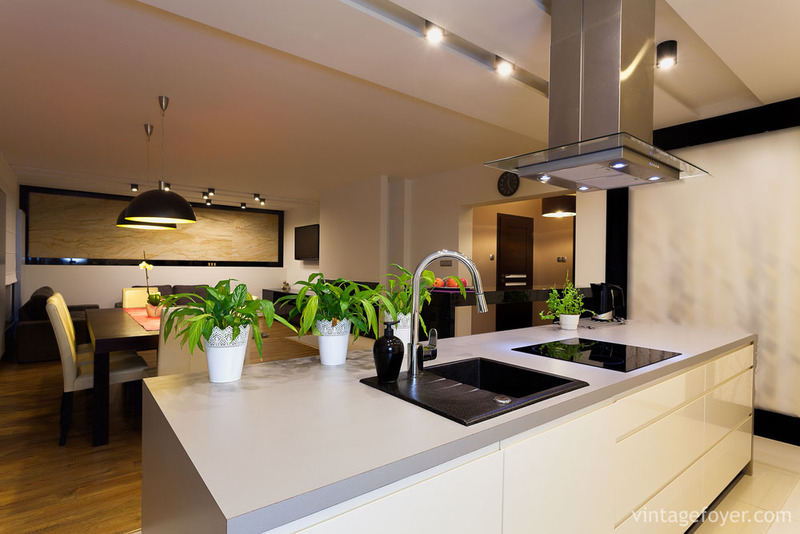 Some modern kitchens will match colors to make a sleek, streamline appearance while others will mix things up to give the room more variety and depth. 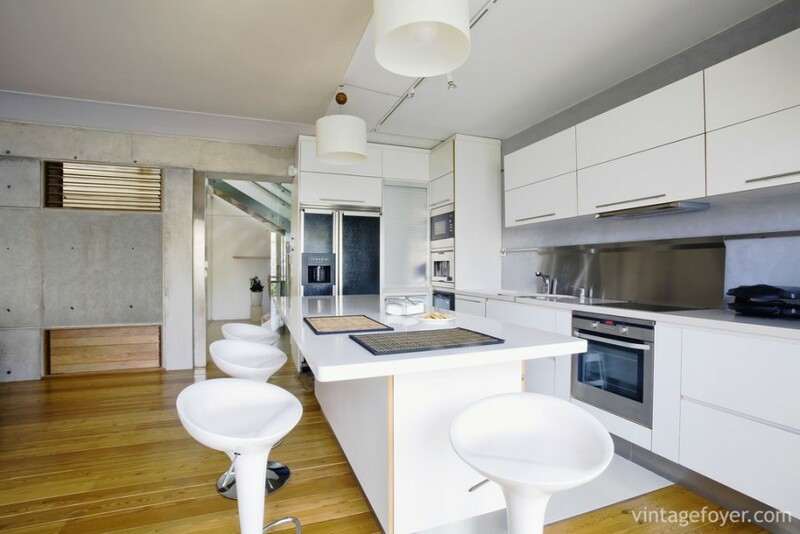 Each of the following 47 kitchens gives a good example of a modern room with a clean design. This kitchen uses dark colors highlighted by stainless steel appliances and a pop of color with the green tile floor and dark wood around the island. The key to keeping this room open is bright light so it does not feel too dark at any time. 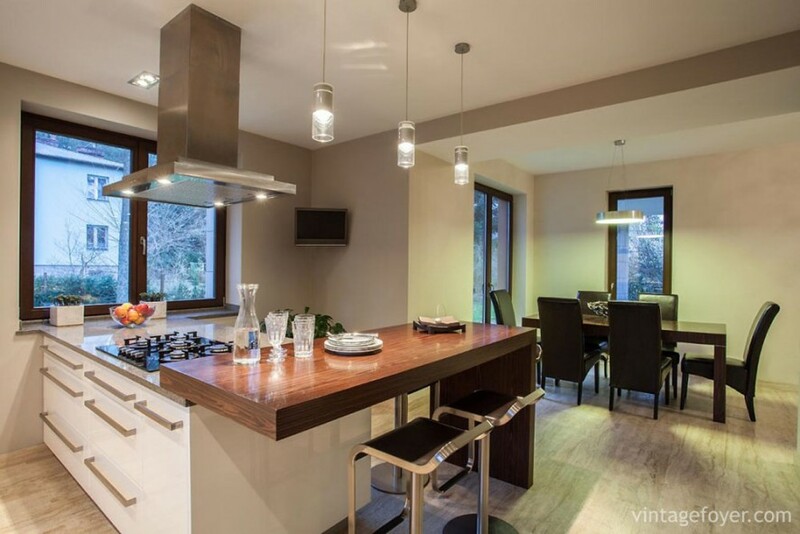 Light wood colors can also make a kitchen look and feel very modern. Couple pine floors with light wood cabinets and the kitchen is bright and sleek. 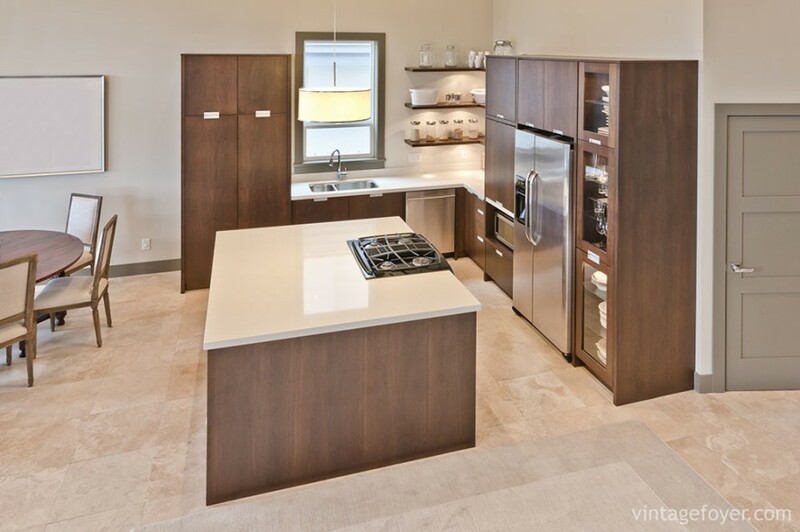 The laminate countertop and tile floor break up the wood and the stainless steel appliances add another modern touch. 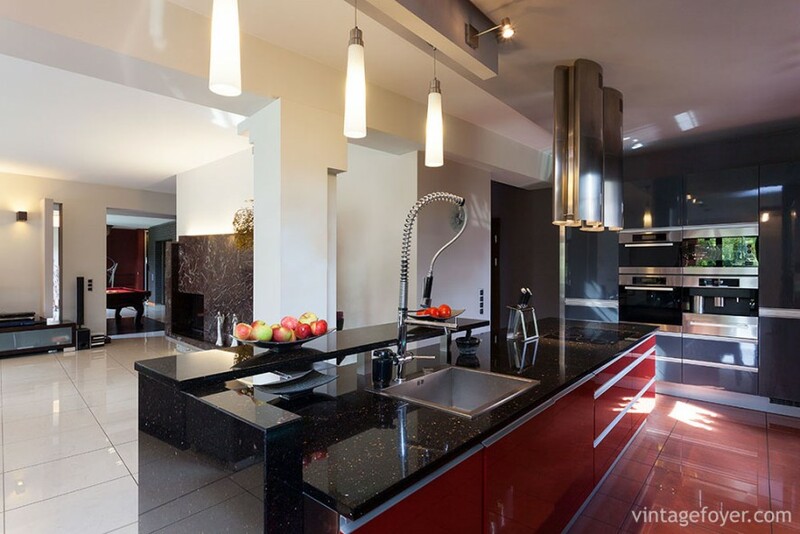 Using stark contrasts between dark and light make a modern kitchen eye-catching. 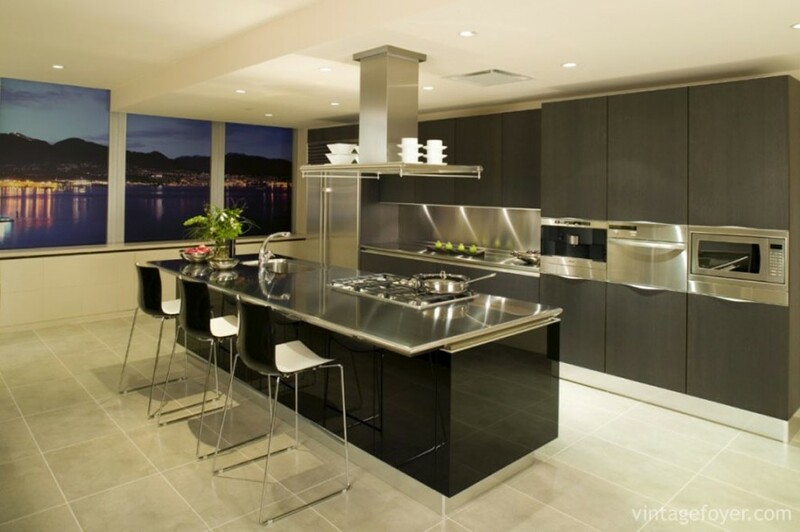 The dark floors blend into the sleek stainless steel appliances while the countertops echo the colors. The white cabinets and island surround offer the eye a brighter style while the chairs complete the modern look. 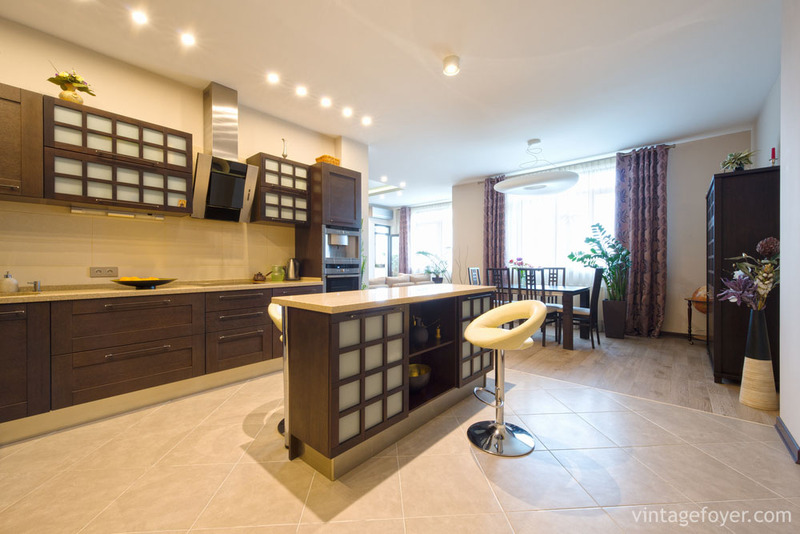 This kitchen gives an air of sophistication due to its patterns and shapes. The light colored wood offers brightness in a room without a lot of natural light. 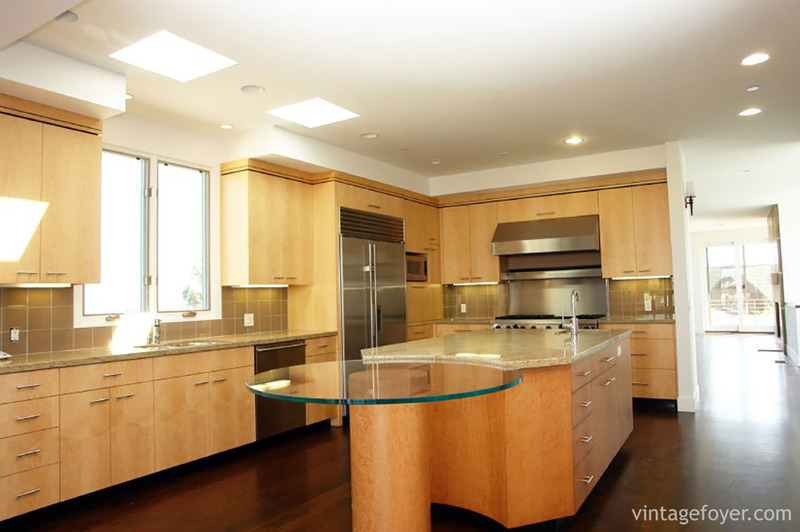 The symmetrical cabinets start the pattern, but the round glass island helps to give the room a much more modern feel. Every element in this kitchen has a modern flair starting with the chunky wooden breakfast bar and moving into the white cabinetry and even the black and silver laid back chairs. The overhead lighting offers a touch of personal style to complete the look. 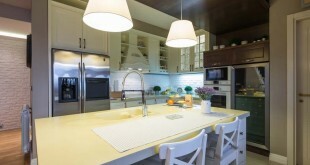 Everything has a place in this kitchen and though the colors vary, they mix together well. 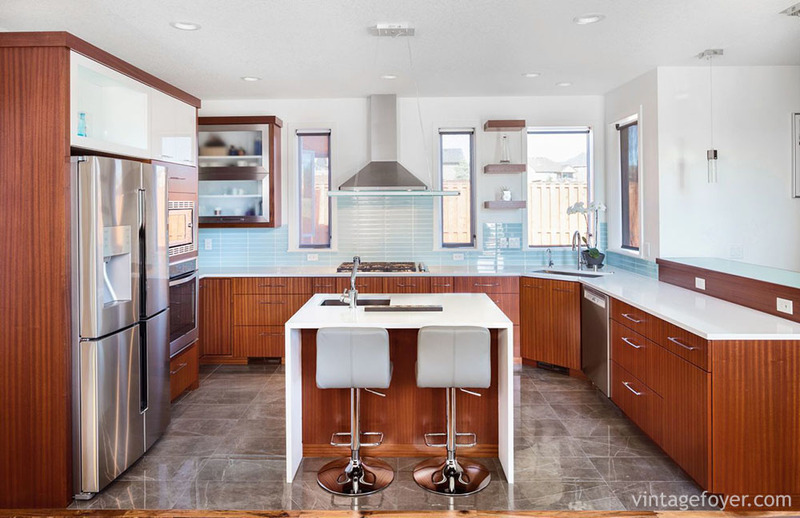 The dark wood contrasts well with the white countertops and the light blue backsplash adds a much-needed pop of color. 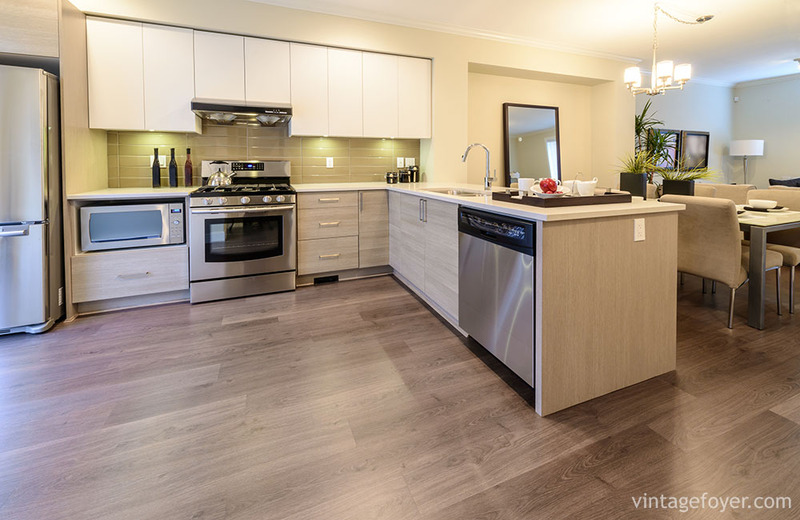 The stainless steel appliances bring the room together in addition to the gray tile flooring. 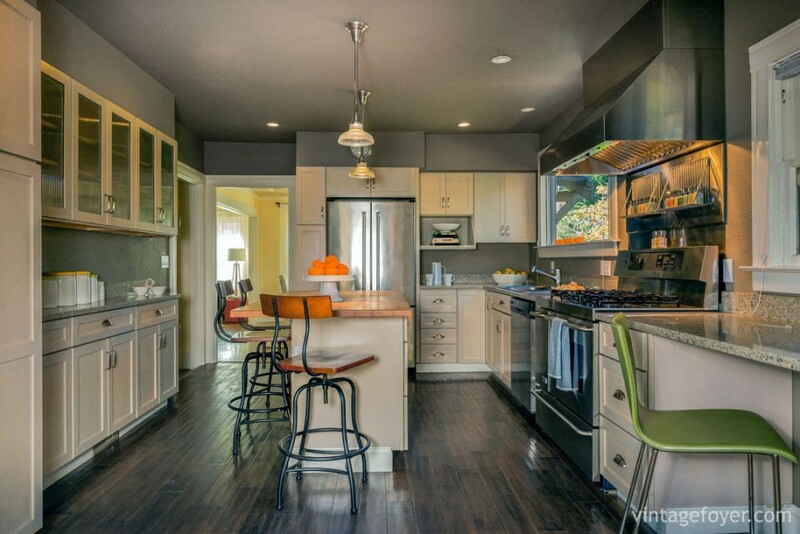 This kitchen uses its colors to add light and space to the room. The light tile floors, walls and counters allow the room to feel lighted and large no matter how many people are in the room. The dark island surround breaks up the color monotony and the dark chairs around a glass table add to the modern appeal. 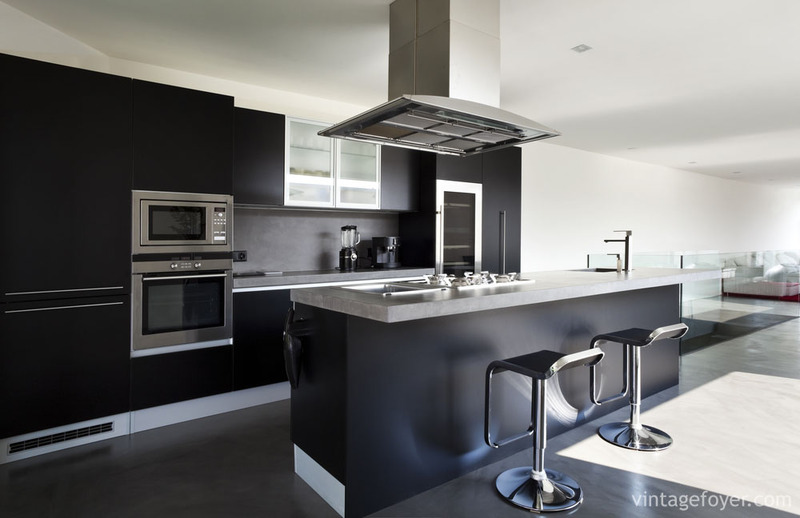 Black and white contrasts are high end in modern kitchen designs and this room uses them to the max. 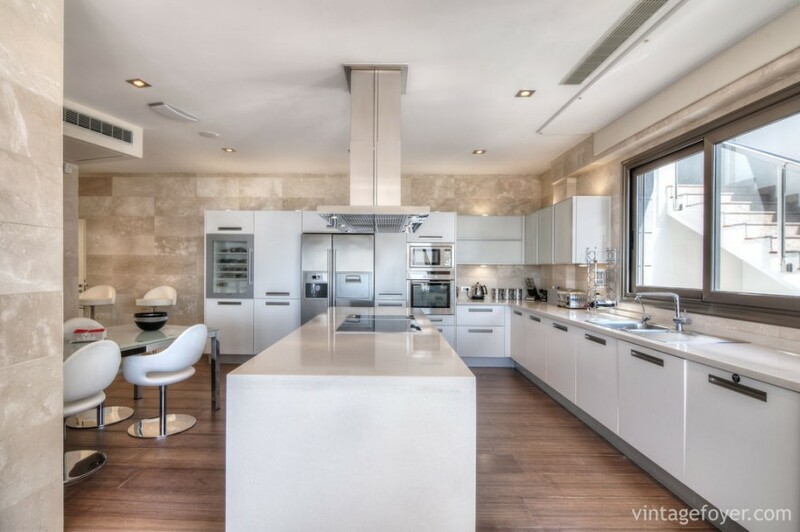 With light colored tile floors and marble counter tops as well as a silver backsplash, the light colors are evident. 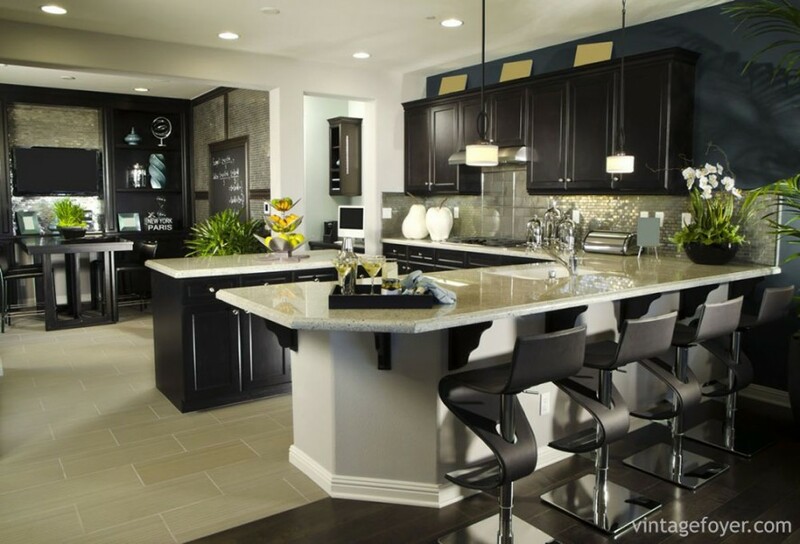 The black cabinets, tables and chairs bring the dark side of the spectrum into the design. A different way to show the modern style is with a pop of a unique color coupled with stark white features. 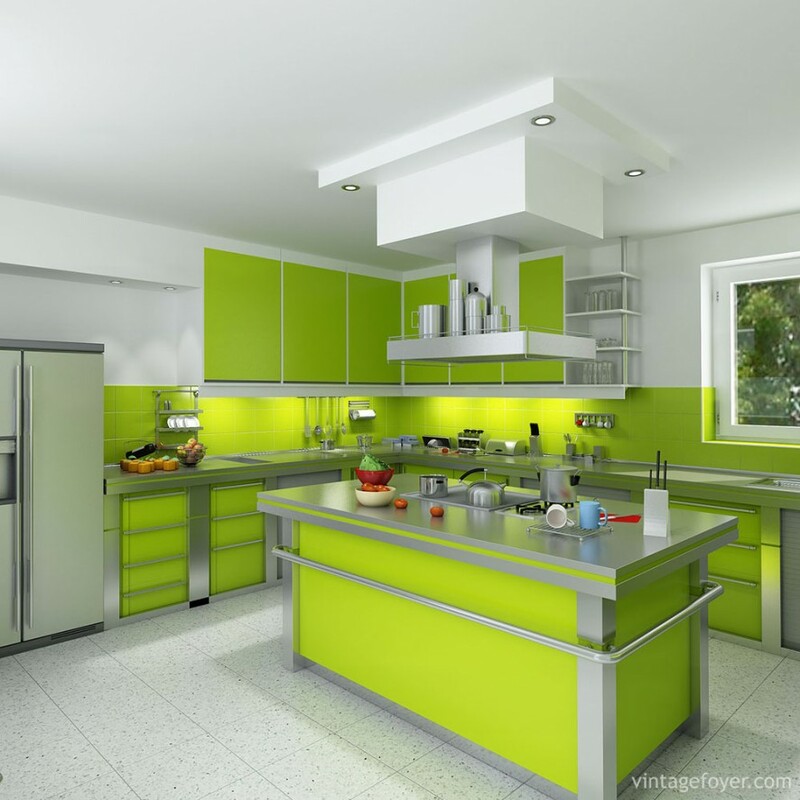 This room shows white tiles and stainless steel appliances set off by lime green cabinets split up with stainless steel highlights. This kitchen still shows the stark contrast between black and white with white tile floors and counters, but it also brings intriguing colors into the room with a startling purple wall and a deep brown throw rug. Not all modern kitchen feature stark contrasts. This coordinated effort highlights many of the same color tones in a muted contrasting manner. 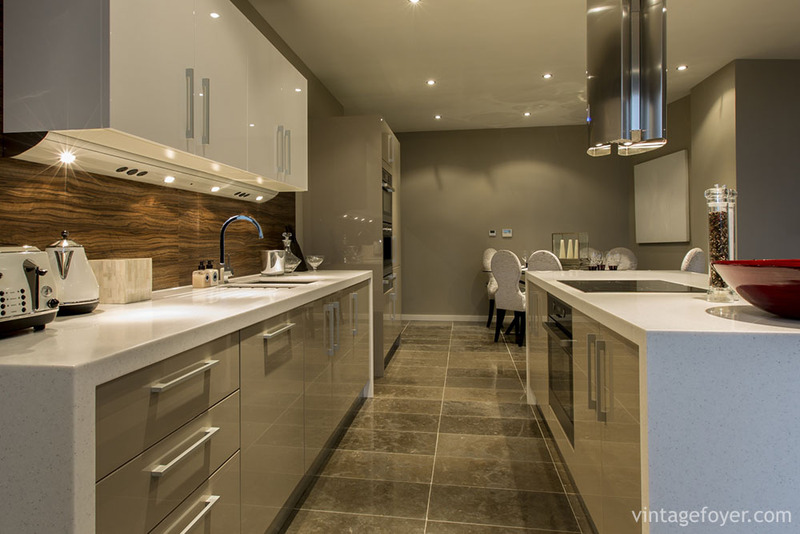 The tones of brown and silver blend together and coordinate well, but still bring about the modern flair. 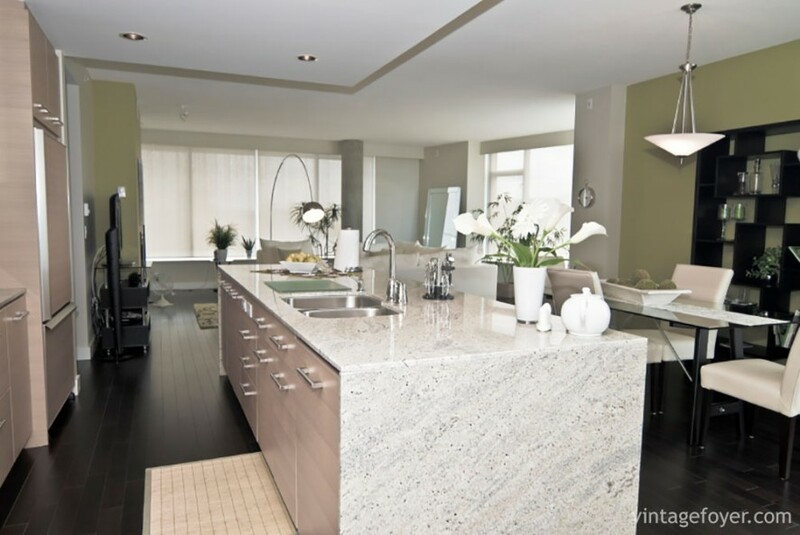 This room highlights modern elegance with gleaming white floors and shine black countertops. The effect is complete with a deep red coloring and stainless steel appliances. Even the sink fits in with the modern effect. 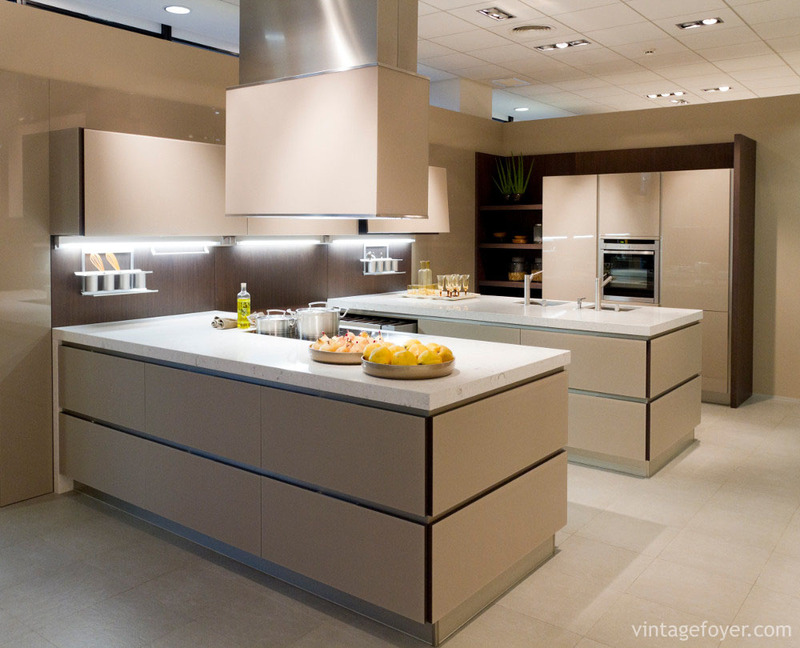 Modern kitchens often feature structured lines and distinct breaks in color. 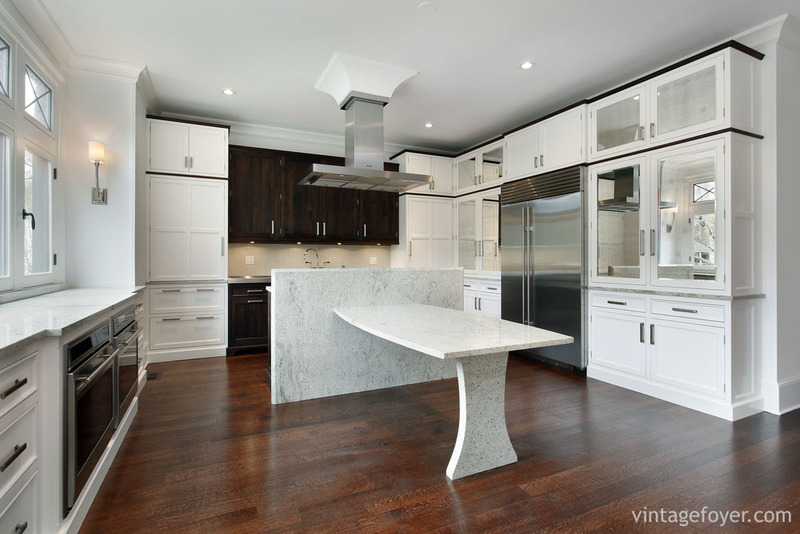 This kitchen is a great example of right angles with the white marble island and the black wood floor. 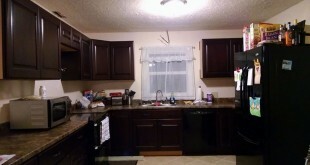 It would be hard to look at the brightness in this kitchen without the black highlights. The white breakfast bar, chairs and cabinets bring the modern look around to its fullest and the black under cabinets and the gray and white countertops hold the look back and tie it all together. 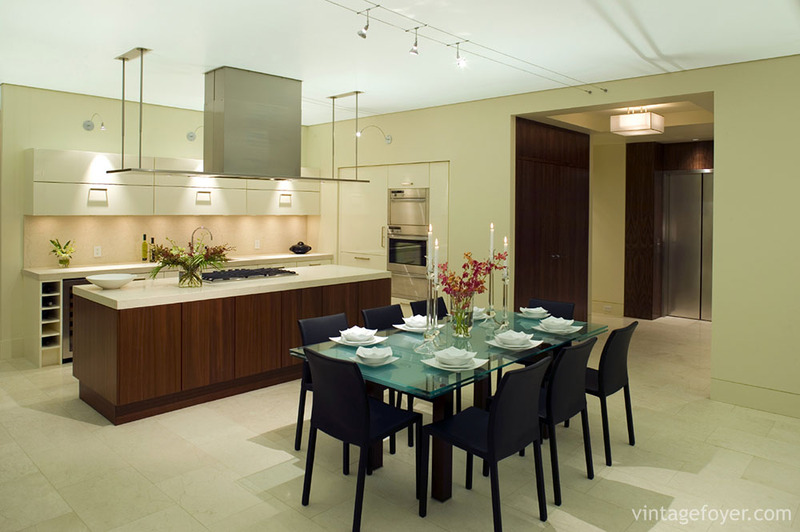 Modern kitchens can also bring several looks together into one room. 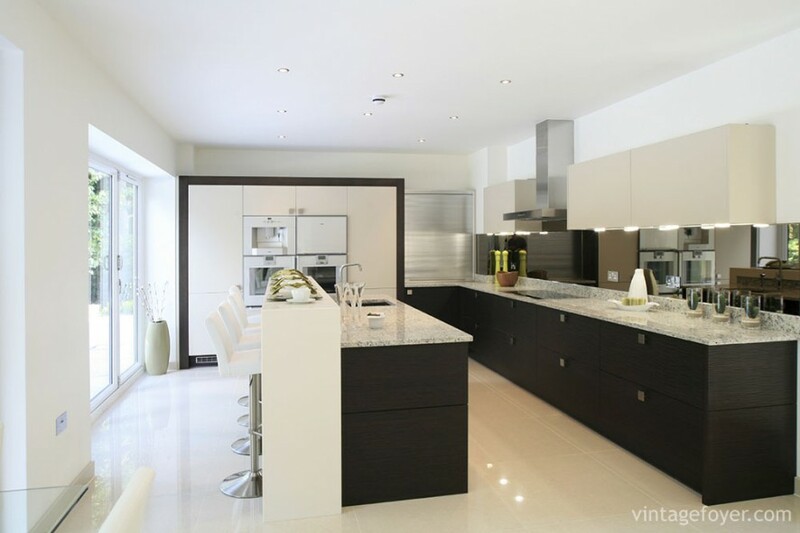 There are black and white elements in this room between the countertops and the floors, but the transition between the two is left to the light colored wood cabinets. Black and white are not the only colors allowed in a modern kitchen. This room features white tile floors and a muted gray backsplash along with black cabinets and stainless steel appliances. It ties the colors together with a mottled gray marble countertop and a great use of color in light lime green chairs at the breakfast bar. 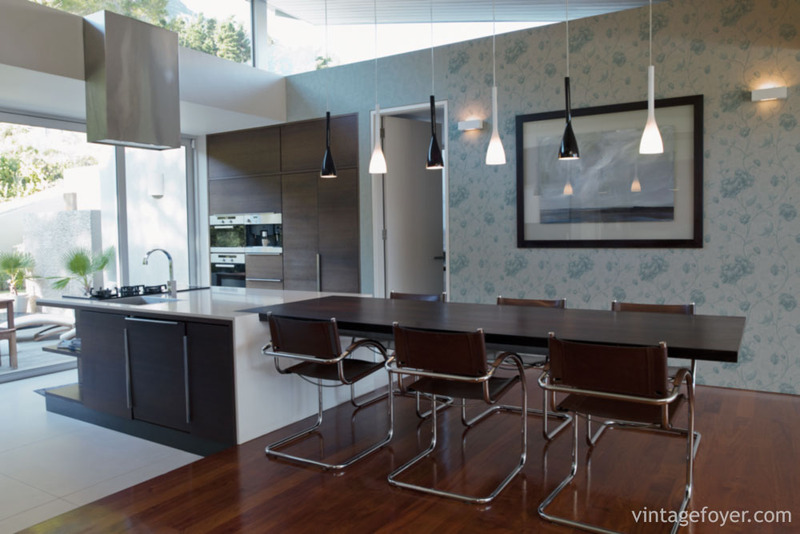 One key to creating a great modern kitchen is making sleek lines. This kitchen is nothing but sleek all the way around. The muted brown tones of the under cabinets are broken up with darker lines and set apart from the white countertops and floors. 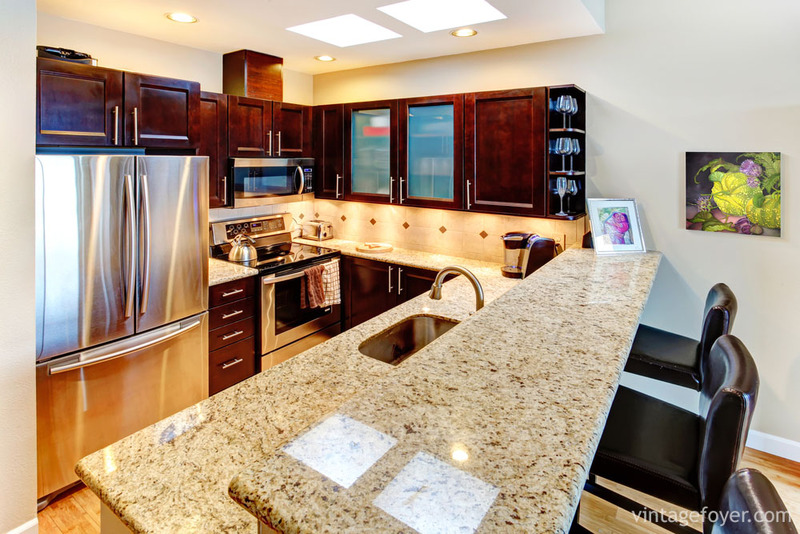 This kitchen almost has the feel of a professional kitchen with stainless steel appliances and counter tops. The white and black chairs tie the white tile floors and black cabinets and island together nicely. When there is plenty of natural light in a kitchen, it is easy to make the room feel big and open, but this kitchen would do it alone even if it were enclosed. The white counters and floors open the space into the next room and the black cabinets give it a modern touch. The bright colors in this kitchen give it a country feel, but the black counter tops and modern white and silver chairs bring it over to the modern side with ease. The modern look does not have to be boring. This kitchen adds colors and style to the normal black and white contrasts by allowing dark wood floors and muted floral wallpaper into the room. The dark and light contrasts are a little less severe in this room with the color choices. The light pine wood flooring brings in the white aspects while the dark countertops and cherry wood cabinets offer the other side of the color wheel. The round island in the middle gives the room a complete modern look. 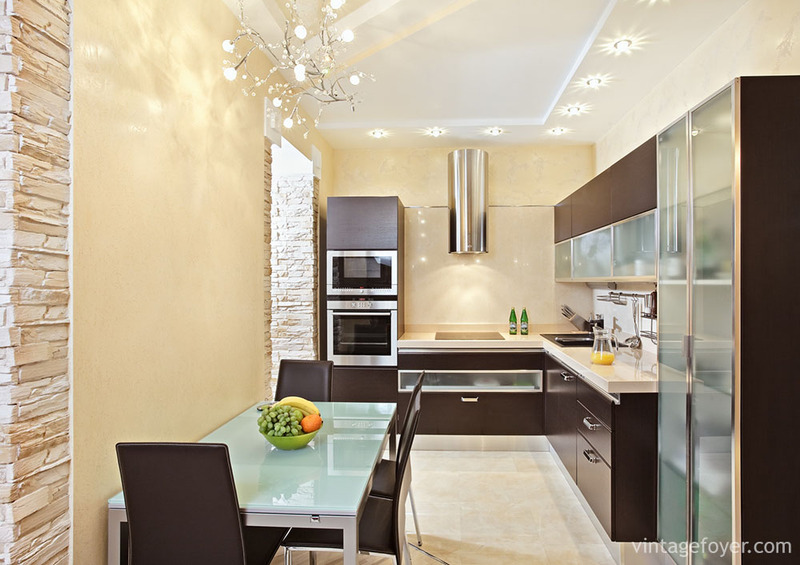 At first glance, this kitchen seems to be well coordinated and rather monotone. Upon further inspection, the coordination and differences are evident. The white counter and cabinets hide the slightly gray interior while the backsplash changes the tone of the room with a dark wood look. 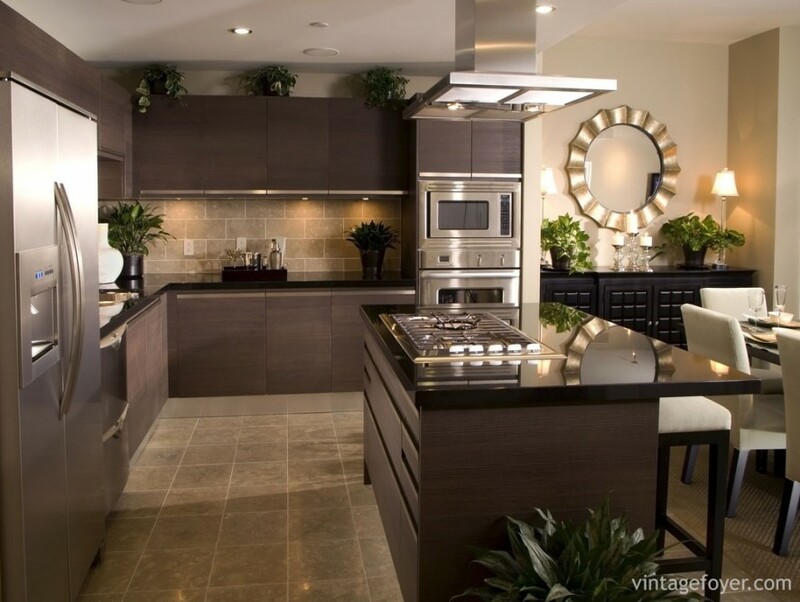 This appealing kitchen utilizes dark and light elements as well as a triangular shaped island to achieve a modern look. With cherry wood cabinets and white tile floors, the contrast is stark and yet unique. The tiled backsplash adds an eye-catching appearance to the center of the room. 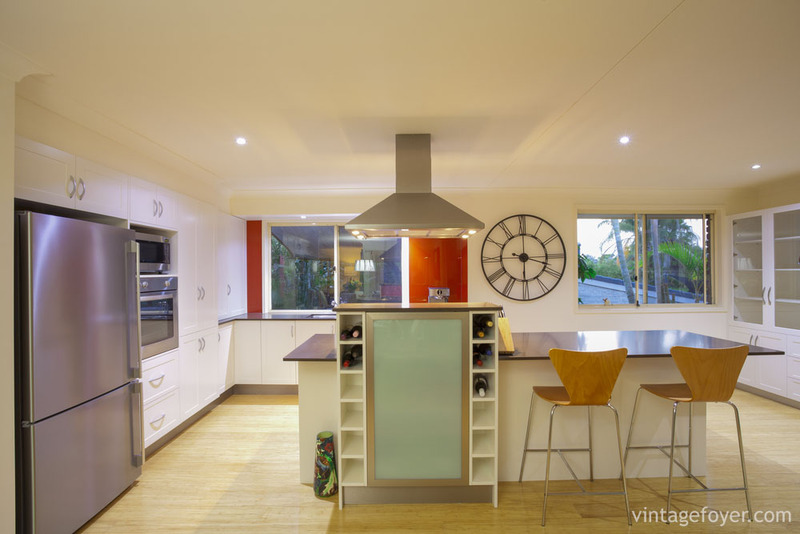 This modern look comes across as cheery, even though it is smaller than many modern kitchens. The yellow tint in the wall helps the kitchen feel open and the stone surround in the entryways brings an element of fashion. 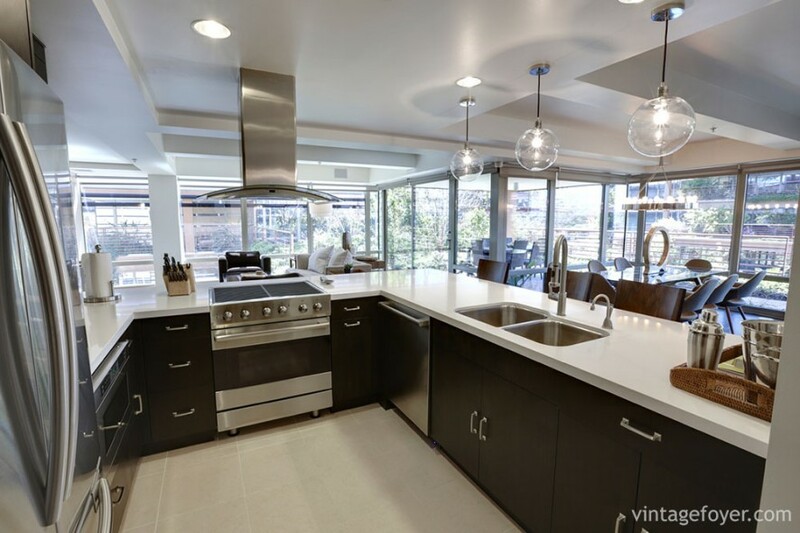 The white tile floors contrast with the black cabinets and the stainless steel appliances bring it all together. There are not as many color differences in this kitchen as white is the predominate aspects in the flooring, countertops, and cabinets. 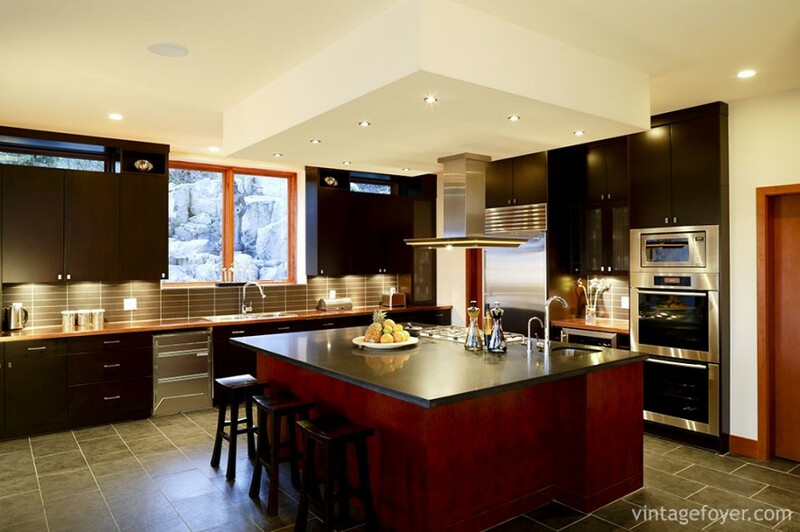 The kitchen breaks up the white tone with highlights of dark wood, black chairs, and stainless steel items. This room uses dark wood instead of black on the cabinets to get the modern look and the white tile floors and cabinets as well as the walls and backsplash go along with the white theme. The dark wood comes in again on the tabletop and the black element blends into the room on the chairs. This modern look is more colorful than most with bright wood floors that accentuate the size of the room. The stainless steel appliances fit into the gray island surround and the white cabinets run right into the wall color. The seamless transition from color to color in this room gives it a sophisticated modern appeal. The specialized decorations like the round mirror on the back wall help the room have personality. 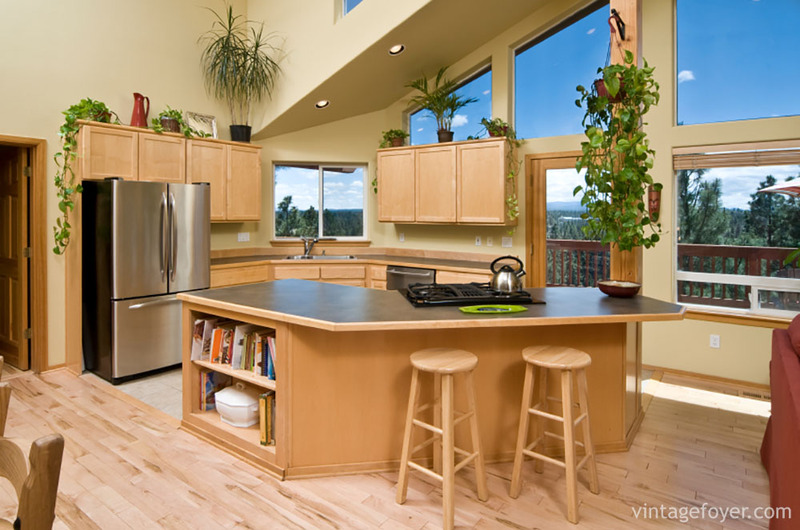 This kitchen offers a variety of colors to break up the white cabinets and light wood floors. With a few highlights in the chairs, wood wall area, and clock, the room has plenty of interesting points. 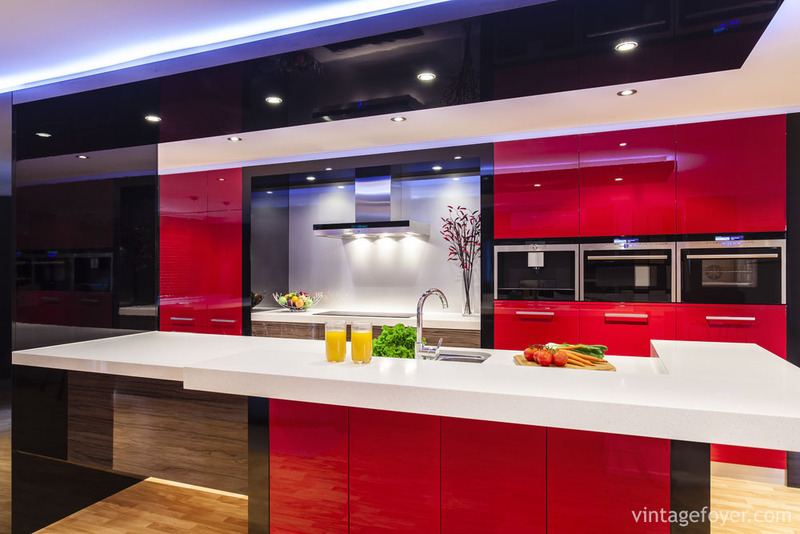 The bright pop of red in the cabinetry gives this kitchen a modern look to remember. When coupled with white cabinets and black ceilings it really stands out. This modern kitchen has a unique open appearance that is hard to match. 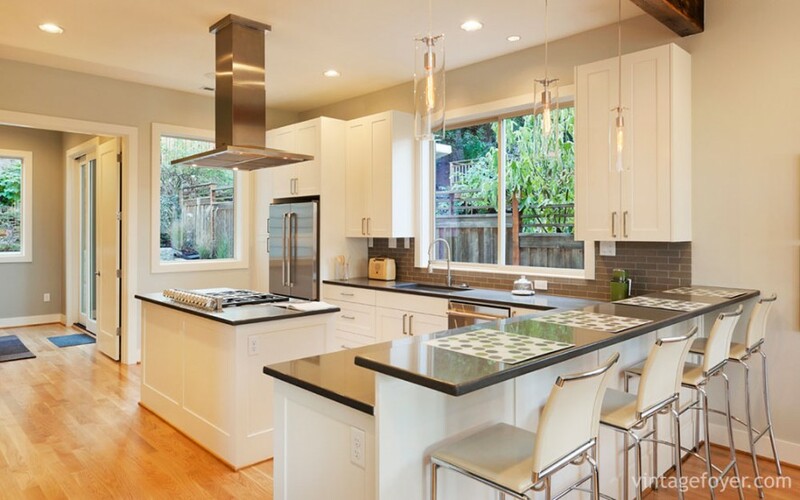 With lots of natural light and clean lines, the kitchen appears almost endless. The white cabinets break up the dark wood flooring and the dark countertops. The modern seats in this room are enough to give it an edge, but the white cabinets and unfinished gray wall looks extend the style. The kitchen area of this space remains mainly white, but the color comes into the room from the wood floor in the next room and the black table brings the modern look to the forefront. 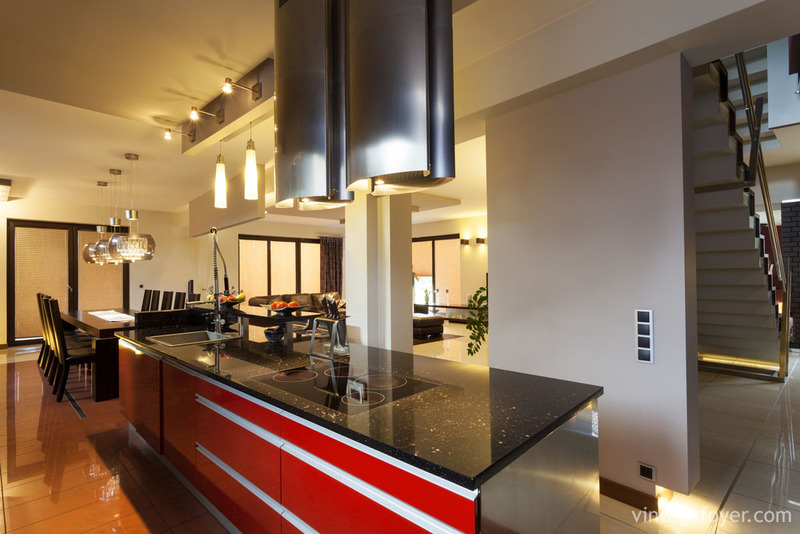 This modern kitchen almost mixes contrasts without surprise, until the red cabinets come into the picture. 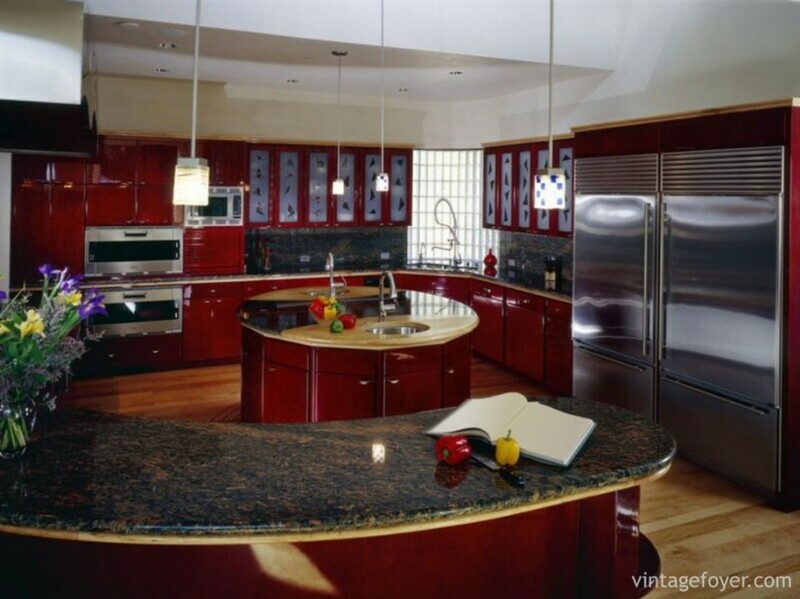 The red gives the kitchen a pop of color without overdoing the modern appeal. The lighting is very sophisticated as well and adds to the overall look of the room. Smaller kitchens are hard to decorate, but this space does the modern look well. The light marble countertops and wood floors cover one end of the spectrum while the black chairs and dark cherry cabinets bring the other side into the room. 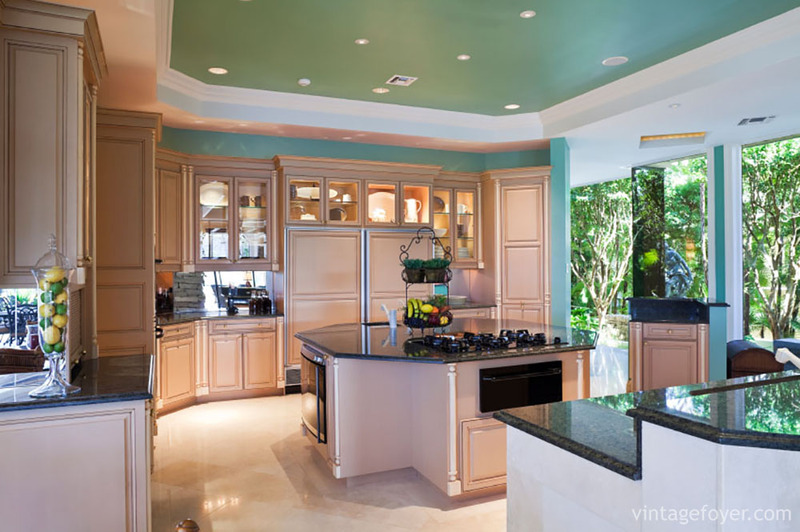 There are not as many contrasts in this kitchen, but the colors work well together in a seamless manner. A few darker elements come into play, but the gray and white elements are standard with this modern look. 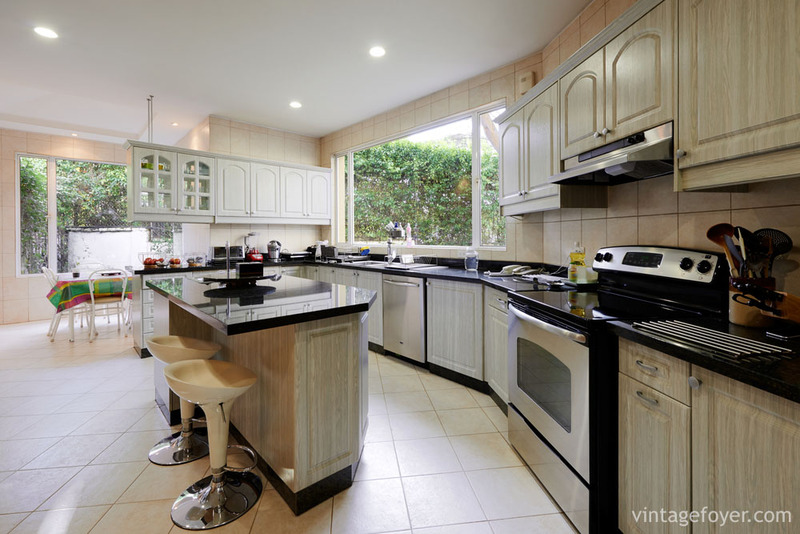 This large kitchen has white tile floors and black countertops. 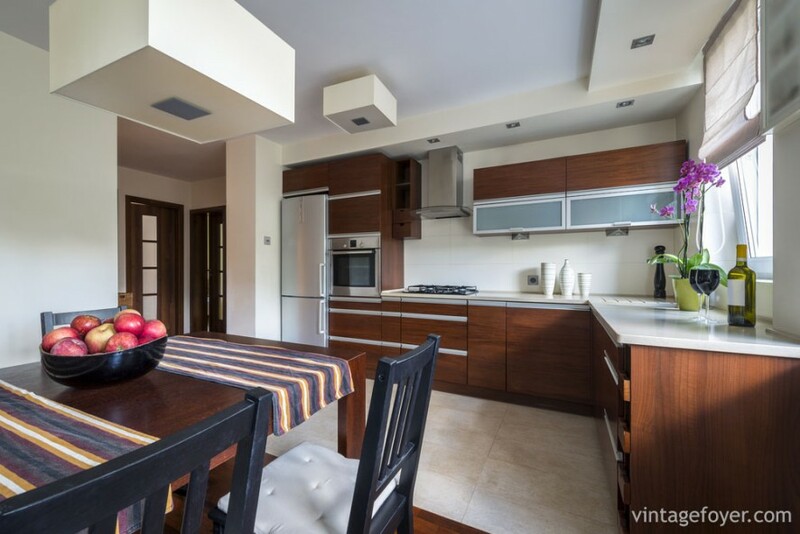 The wood grain cabinets help to tie the two colors together nicely and the highly modern chairs fit in an out of the way space beneath the breakfast bar. Most of this space is filled up with stark white colors, but the tone changes in the tiles on the walls. 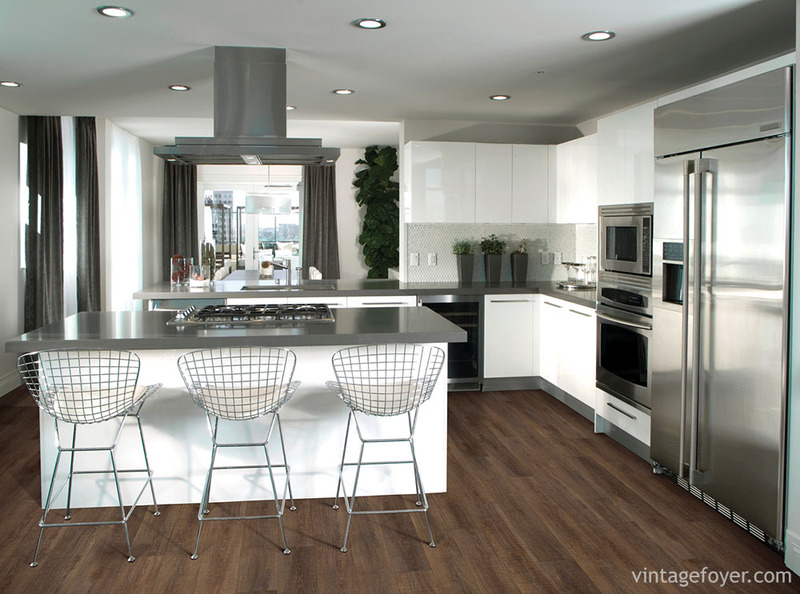 The dark wood floor transitions to yet another level of color and the overall look comes off clean and modern. 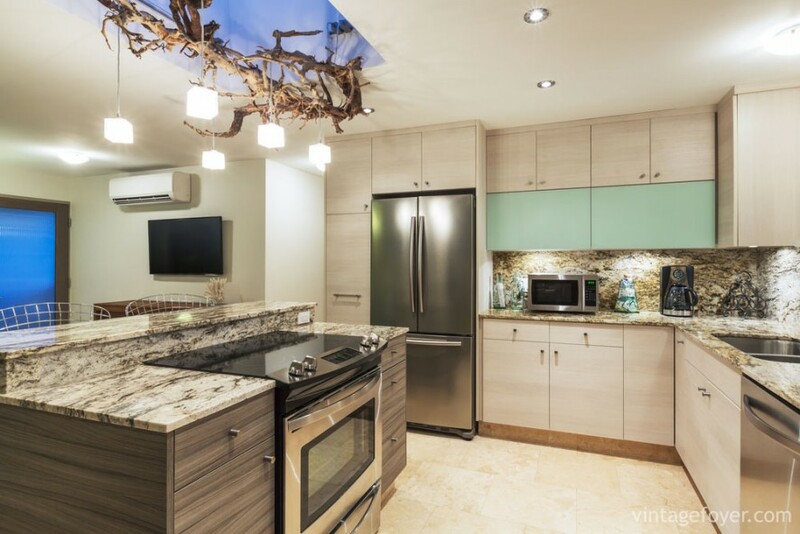 This kitchen has a modern rustic appeal with a large branch lighting hanging prominently over the center island. Add a pop of color around the cabinets, an intriguing marble backsplash and wood grain items as well and the room has plenty of areas of interest. 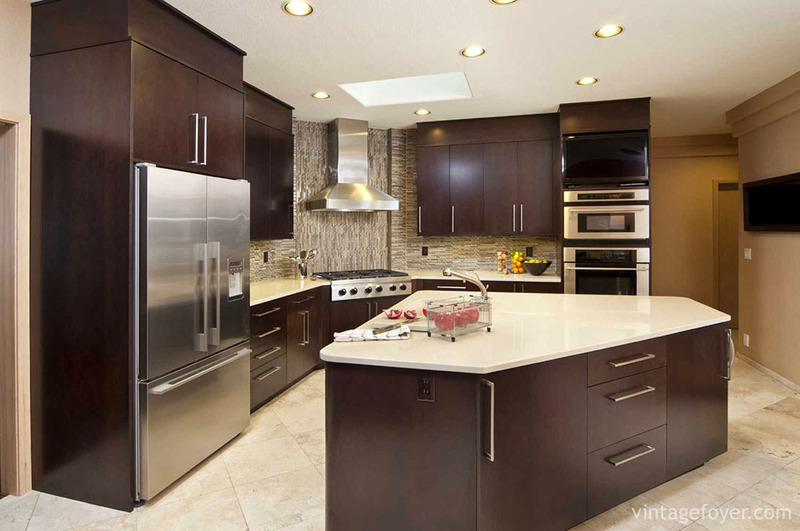 This kitchen does not contrast as sharply as some modern rooms, but the dark and light elements are still there. The light tiles and dark wood offer the distinct lines that a modern room needs. The beautifully grained dark wood floor highlights the white cabinets and offers a great setting for the eye catching colorful chairs. 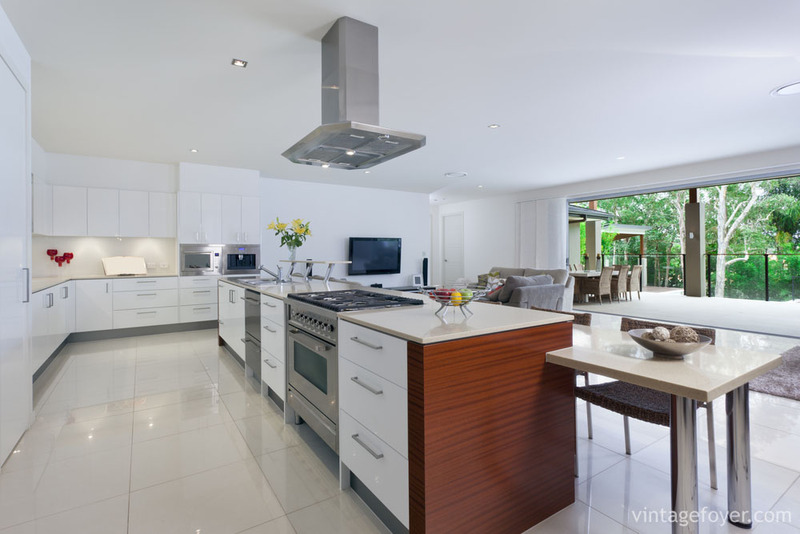 Some modern rooms give the eye plenty of shapes to inspect and this kitchen has plenty of offer. With rectangles and squares on the cabinets and contrasting colors, and even unique chairs stand out for their shapes this room has it all. 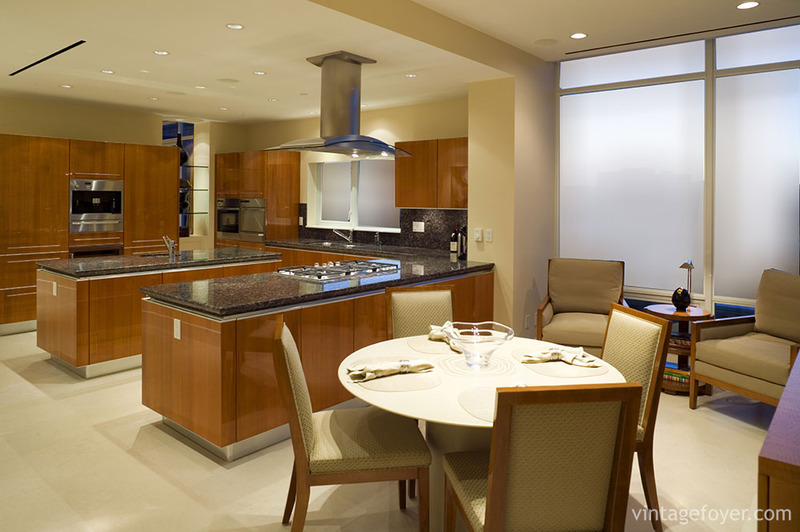 Kitchens that are sleek and modern also often have a professional air. This kitchen would be one that professionals would admire with its black walls, stainless steel appliances, and white elements. The marble on this kitchen’s island extends into a very modern looking table, all of which is highlighted by the dark wooden floor. 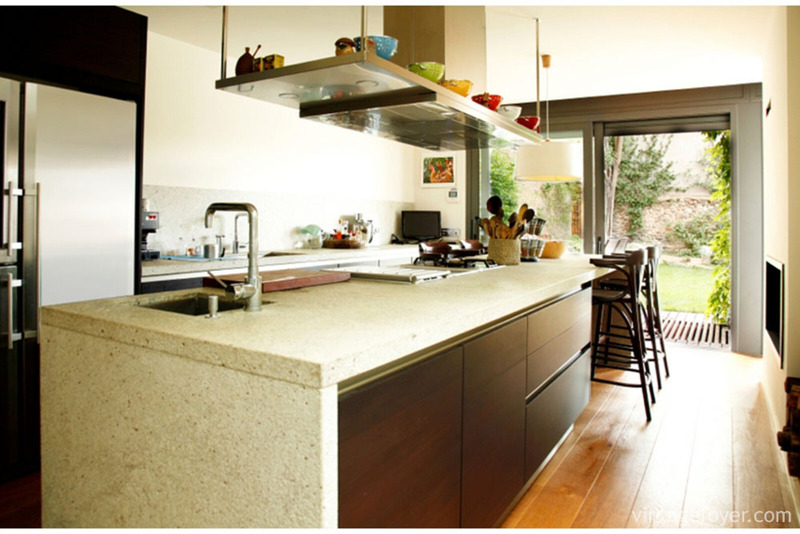 The counter runs parallel to the kitchen island, giving it the lines needed in a modern kitchen. 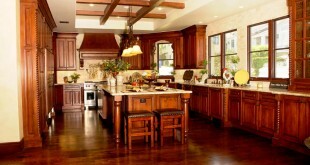 The lighter wood brings the floor color together with the dark countertops as well. 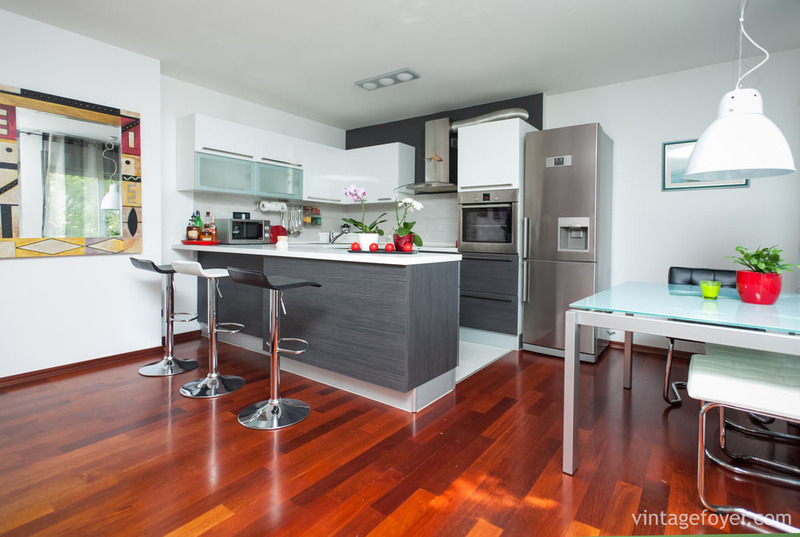 This kitchen brings the dark and light colors together by utilizing a medium colored wood floor. 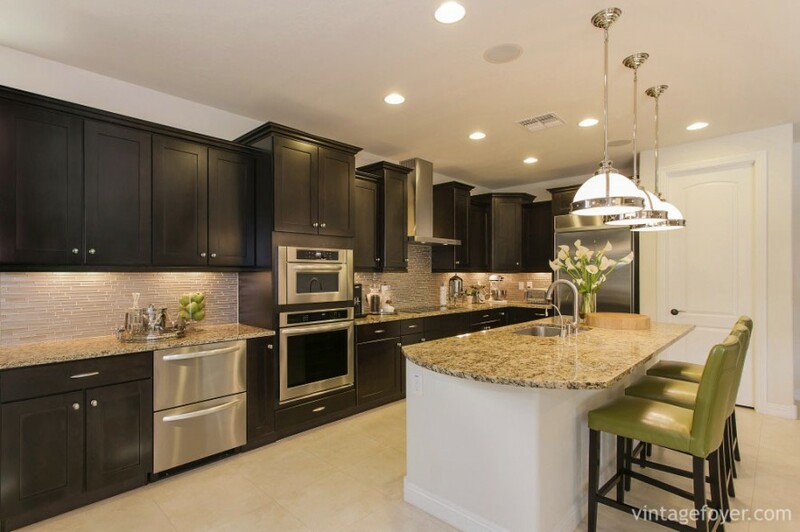 The light countertops fit well with the startling dark cabinetry and stainless steel appliances.